Roots and Tendrils Now Available! SPECIAL MP3 OFFER WITH BOOK PURCHASE! Get the Book and FREE mp3 Now!! A lyric and insightful collection of poetry about the punishing love encounters that lead to growth and ultimately self-love. In her debut collection of poetry, Roots and Tendrils, Heidi Dellaire navigates the intimate journey of heartbreak and self-discovery. The journey assembles a decade of transitory love encounters following the end of a significant long-term relationship. Each poem, musing and affirmation advances the reader through love affairs both searing and exhilarating in their intensity. You’ll meet the narcissist, the ghoster and the gas-lighter. You’ll travel to the ocean, visit a cave, be ready for combat and soar through the mist. Then you will step from pain into the light of love where you too, will grow. Get Your Copy of Roots & Tendrils Today! “Throughout life, you will experience many different kinds of relationships and they can evoke positive or negative emotions that leave a lasting significance on your personal mindset. 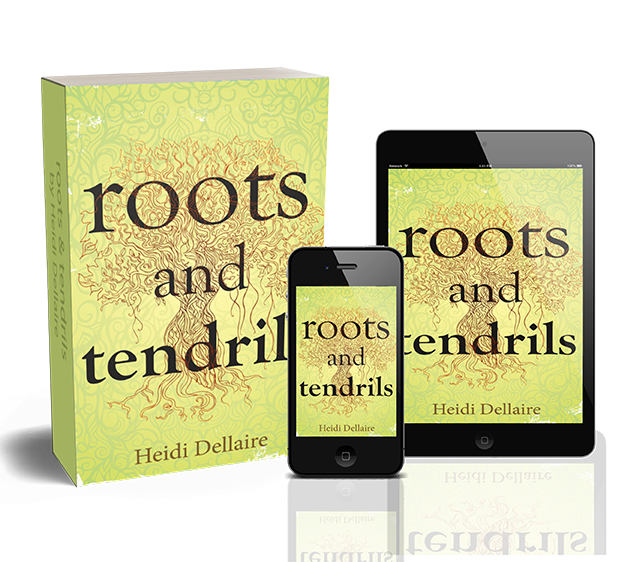 In Roots and Tendrils by Heidi Dellaire, discover how the choices we make and our self-awareness can impact the types of people we draw into our lives. This collection of poems will take you on an emotional journey of self-discovery and analysis covering such subjects as dealing with toxic people, the feelings of regret at past mistakes and choices, failed relationships, and dealing with heartbreak. There are positive affirmations throughout too which will ensure you gain a clearer understanding of the human mind and behavioural patterns we all experience at some stage in our lives. “Roots and Tendrils by Heidi Dellaire is a beautiful book of poems dealing with love. She writes about lost loves, heartache and finding herself. The poems show us how the one person we need to love is ourselves before we can love others. Heidi Dellaire uses lovely imagery and rhythm to share her thoughts in thirty-eight poems. Some of them are composed of one sentence in bold, and those poems are like nuggets of wisdom. I thought that Roots and Tendrils by Heidi Dellaire was a beautiful book of poems. It was like being with a friend that I can relate to, sharing secrets and all. I loved the imagery of her poetry. My favorite one was Squirrel. I definitely felt the same way. Heidi Dellaire’s work has a nice rhythm to it, using different types of poems to keep it going. I loved the one-sentence ones; they were like reading gems of wisdom. I was surprised by the one that said, “When you ask the universe for signs, don’t ignore them when they show up.” I thought I was the only one who did that, and it was refreshing to see I was wrong.